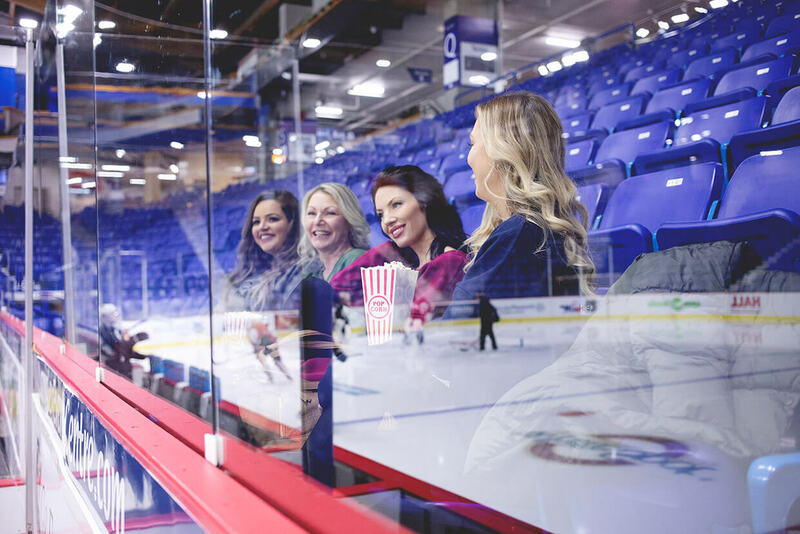 Watch this video to check out three Canadian women's rink-side style and see our fleece lined leggings in action! Most of you have watched a live hockey game at some point in your life. You may go to an occasional game or perhaps you’re even a season ticket holder. If you have kids who play the sport, the arena is probably your second home! Get the Look (From left to right): Kristina is wearing the Hockey Mom Sweatshirt (Grey, L/XL), Subzero Fleece Lined Leggings (Maroon, 12″ 2XL), Swift Moves Sneakers (Grey, 10). Julia is wearing the Hockey Mom Sweatshirt (Burgundy, M/L), Subzero Fleece Lined Leggings (Black, 9.5″, XS), Per-Suade Me Boots (Black, 8). Lauren is wearing the Hockey Mom Sweatshirt (Navy, S/M), Altitude Leggings (Black, 9.5″, XS), One Step Ahead Sneakers (Black). Sandy is wearing the Hockey Mom Sweatshirt (Green, M/L), Subzero Fleece Lined Leggings (Black, 12″, M), Out of This World Glitter Sneakers (Black, 8). 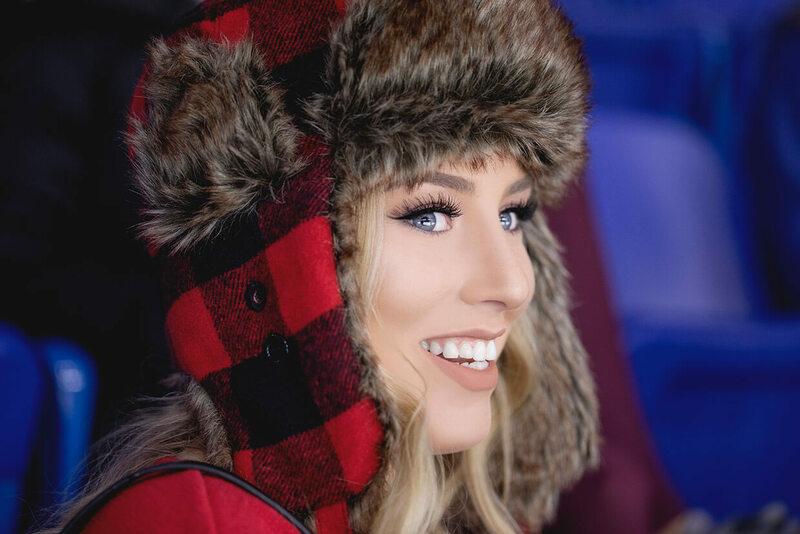 Get the Look: Lauren is wearing the Backcountry Plaid Hat (Red Buffalo Plaid). Whatever your connection to this well-loved Canadian sport may be, you know what it’s like to be sitting in a freezing cold rink, wishing you had worn something warmer. Choosing your outfit for a hockey practice or game can be difficult when you don’t have the right pieces in your wardrobe. 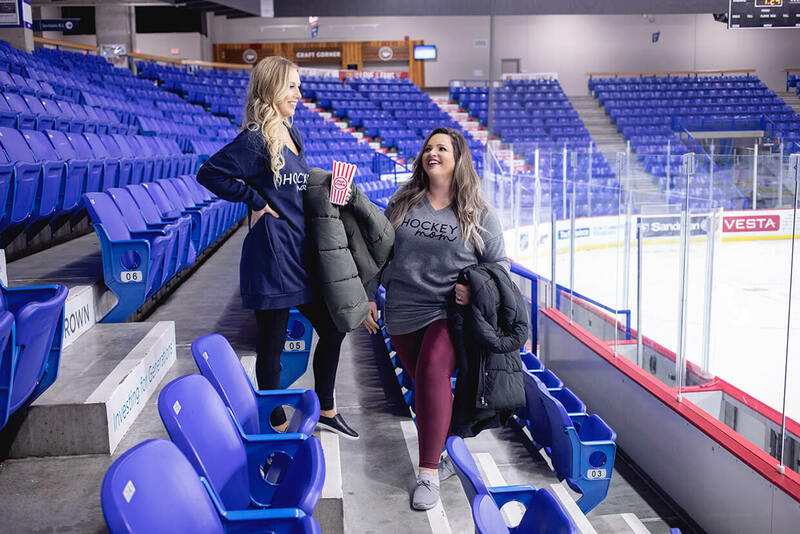 Get the Look (from left to right): Lauren is wearing the Hockey Mom Sweatshirt (Navy, S/M), Altitude Leggings (Black, 9.5″, XS), One Step Ahead Sneakers (Black). Kristina is wearing the Hockey Mom Sweatshirt (Grey, L/XL), Subzero Fleece Lined Leggings (Maroon, 12”, 2XL), Swift Moves Sneakers (Grey, 10). 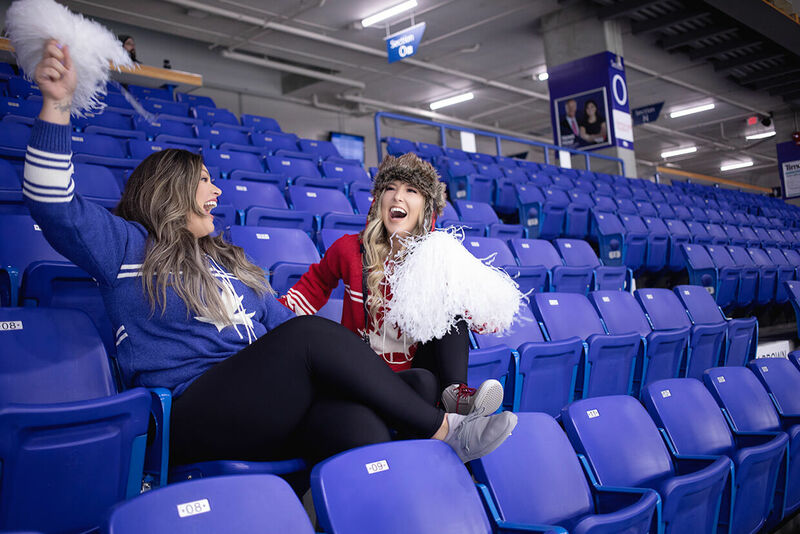 The trick to staying warm and stylish rink-side is investing in some quality pieces that are designed for cooler temperatures. You can stay cozy without wearing a million layers. Piling on the clothes is not always that flattering. The right pieces can help you create a sleek silhouette, while still allowing you to enjoy the game without freezing to death, even if it goes into overtime! For warmth and comfort at the rink, a pair of fleece-lined leggings is key to keeping your lower half the perfect temperature. Get the Look: Julia is wearing the Good Things Come Sweater (Light Grey Melange, S), Peak to Peak Jacket (Black, XS), Subzero Fleece Lined Leggings (Maroon, 9.5″, XS), Swift Moves Sneakers (Grey). Fleece-lined leggings pair perfectly with sporty sneakers and a long hoodie for an athleisure look your friends will envy! Get the Look: Sandy is wearing the Lodge Lounger Hoodie (Ivory and Black Plaid, M), Subzero Fleece Lined Leggings (Eggplant, 9.5″, M), Out of This World Glitter Sneakers (Black). Show off your Canadian pride with a warm, knit sweater. 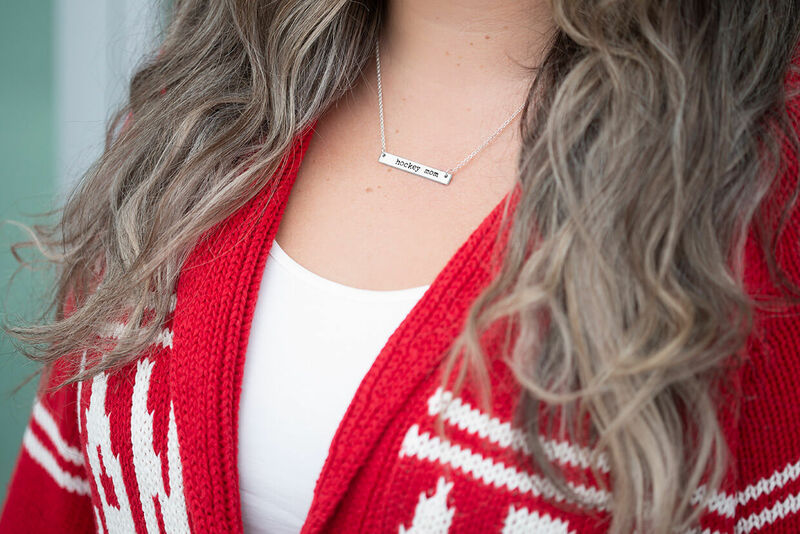 If you are cheering on your kids, then there couldn’t be a more perfect addition to your fleece-lined leggings outfit than a Hockey Mom Necklace! Get the Look: Kristina is wearing the Canadian Girls Cardigan (Knit Red and Cream, XL), Hockey Mom Necklace (Silver). Cheer them on in style and comfort! Fleece-lined leggings are a must-have for your winter wardrobe, and for wearing year-round at that chilly arena! Our fleece-lined leggings are available in a wide selection of colours and patterns, so the outfit possibilities are endless. Something that every Silver Icing fan loves about our fleece-lined leggings is that they are available in both 9.5″ and 12″ rises, so you can choose whether you prefer a higher waist or lower waist. You can also choose from leggings with or without pockets. Stylish and practical, fleece-lined leggings with pockets are handy for storing your phone, when you are not taking those rink-side selfies! Get the Look (From left to right): Kristina is wearing the Good Ol’ Hockey Game Sweater (Blue and Cream, XL), Hockey Mom Necklace (Silver), Subzero Fleece Lined Leggings (Black, 9.5″, XL), Swift Moves Sneakers (Grey, 10). Lauren is wearing the Good Ol’ Hockey Game Sweater (Red and Cream, S), Backcountry Plaid Hat, Subzero Fleece Lined Leggings (Black, 9.5″, XS), Out of This World Glitter Sneakers (Grey).